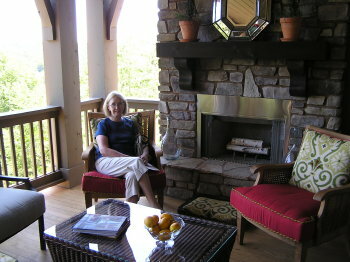 Reynolds Signature Communities and Linger Longer Homes, the same people who developed the hugely successful Reynolds Plantation on Lake Oconee GA, are the developers of Achasta, a mountain retirement community in Dahlonega.Â Â My wife spotted the ad for the 2009 Southern Living Idea home that is in Achasta, and we took a ride up from Atlanta to give it a tour. The price is only $5 per person and well worth it.Â Besides the Idea House, there are three vacant model homes you can tour as well to see how informal mountain living can be. The Southern Living Idea House was beautiful as you might expect.Â Designed by Stephen Fuller.Â It was full furnished and decorated.Â We liked the openness of the home.Â The master bedroom is on the main level on this house and all the models we visited.Â The master bedroom, called the retreat, is open to the outside tower deck. Call tower because fo the 15ft high ceilings. The other bedrooms are on the lower terrace (basement) level.Â Both level were very open to the decks outside which were covered, plenty of stone, an outdoor fireplace,Â and nice views of the mountains and natural wooded areas.Â Â The kitchen was really unique in that the whole wall was a retractable sliding door that open to the outside deck.Â Â It seemed your kitchen was outdoors.Â I guess you could have a sliding screen door.Â The family room open up also to the outside deck with a nice seating arrangement around the outdoor fireplace.Â Same on the lower level with access to the lower terrace.Â That openess to the outside was the main unique feature of the home it seems to me.Â It was nice and a feel good experience.Â There was also an inviting living room.Â The house flowed well from room to room. The lower level had two bedrooms, an family room, bath and another room. Â All with high ceiling and nice carpet. There was an upstairs as well with a family type room and again opening up to the outside deck with great views to the mountains. The Idea House didn’t seem too large but offered many spaces so as not to be crowded.Â The two other model homes we visited were very nice as well.Â I asked the attended the asking price of one of the model and she replied $975,000 with the accessories.Â There were some middle aged couples but most were around my age early sixties.Â There was a large clubhouse and excellent golf coarse in the community.Â Â Achasta is in Dahlonega.Â From Atlanta take GA 400 north to Dahlonega, turn left on Hwy 60 and go about 4.5 miles and you will see Acasta on the right. For the Southern Living Idea House theÂ HOURS:Â Wednesday – Saturday 11 a.m. – 5 p.m., Sunday 1 p.m. – 5 p.m.Â No reservations needed. 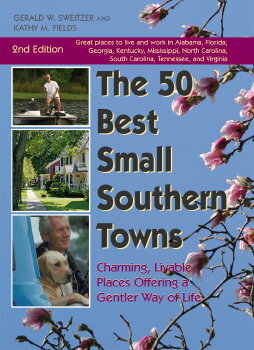 I receivedÂ a copy of The 50 Best Small Southern Towns by Gerald Sweitzer and Kathy Fields that has just come out.Â Living in Georgia, I was very interested in seeing what towns the authors chose. Almost as interesting, was a section in the back of their book titled “Additional Small Southern Towns of Interest” where they listed 4 runner up towns from each state.Â In Georgia these included Cartersville, Sandersville and Thomasville.Â I have been hearing good things about these very towns, so this immediately validated my interest in this book. The authors visited each town listed in the book (more than 150 towns!) and spoke with many regular lay people as well as professionals in each community.Â These really are small towns in that their scope was towns with a population of at least a thousand but no more than 25 thousand. They list many other criteria in their book, too many to list here. After their evaluations, they list 5 or 6 best small towns inÂ eachÂ states (and the 4 runners up towns as mentioned above).Â InÂ Georgia, for example, they list Carrollton, Covington, Dahlonega, Perry, St. Marys and St. Simmons Island.Â Being in the Atlanta area, I like Dahlonega and St. Simons Island best from this list from first glance, but maybe I should visit the other towns listed.Â I do like Sandersville and Carterville from the runner up list they provided. I found this book interesting, especially since at age 60 we plan on visiting as many placesÂ as we can to see what is out there beyond the rat race we just left behind.Â We plan on visiting in our own state first then maybe working in some towns in neighboring states as a combination vacation and research trip. Thanks to Gerald Sweitzer andÂ Kathy Fields forÂ providing such timely informationÂ for me and my wifeÂ Mary Ann. PS: I will try to find out if Kathy Fields is still teaching theÂ Simple Living classes in the Atlanta area that was mentioned in the bioÂ of this book.